In this post I wanted to follow up on my original review of Peak Design’s Everyday Sling back in September 2016 (see The Everyday Sling blog post). Back then I stated, “if you have a mirrorless system and want to travel light, THIS IS YOUR BAG! People who use mirrorless systems are usually trying to keep the load light.” I went on to say that if I had a mirrorless camera, “this would be my bag 24/7!” Well, I meant it, and after writing that post I actually ended up purchasing a Sony A7R mirrorless camera a month later and decided to give the Everyday Sling a shot as my every day bag. There were two reasons for doing this; first, I switched to a mirrorless to lighten the load due to ongoing back issues resulting from surgery in 2010. Second, the folks at Purple Orange Brand Communications and Peak Design had given me a courtesy Everyday Sling and I felt I needed to give it a shot. Plus, since I shot my mouth off about how great it was, I needed to do this! Let me say upfront that the switch was easy and I’m very happy. When I received my Everyday Sling, I used it on days I wanted to travel light, usually taking my Canon 6D and another lens only to head out somewhere on my bike or walking. For the most part, the rest of the bag really didn’t have much in the pockets. Using the Sling now as my every day carry means that it’s obviously heavier because I now carry many of the items I used to carry in the Everyday Messenger. Heavier? Yes, but still very manageble and in no way is it uncomfortable. The bag is designed to expand out and away from your body as you add contents, making it still comfortable to carry. I also find myself usuing the adjustable strap more than I did with the Everyday Messenger. The Sling seems to feel better when I wear it high on my back, so when I need the camera I rotate the bag and lower it to get in. Because of the way this bag’s strap is designed it’s almost one smooth movement and takes no extra time. So what are the drawbacks? Well, if you tried this as your main bag and carried something bigger than a mirrorless, or carried 2 or 3 lenses, I don’t think it would fare well. Strapping a tripod to the bottom seems like it could be a it of a pain as well. Don’t get me wrong, this little bag will do it, I just don’t know how comfortable it would be weighing it down so much. Frankly, if you were carrying a regular size DSLR and a couple of lenses, the Everyday Messenger is the better choice anyway. After four months of carrying the Everyday Sling, I’m comfortable recomending it to mirroress camera owners who are looking for a protective bag for their camera that is full of features. While I still love my Everyday Messenger Bag (or EDM), my former every day carry, that bag is now for when I’m going to travel and need to bring along extras. 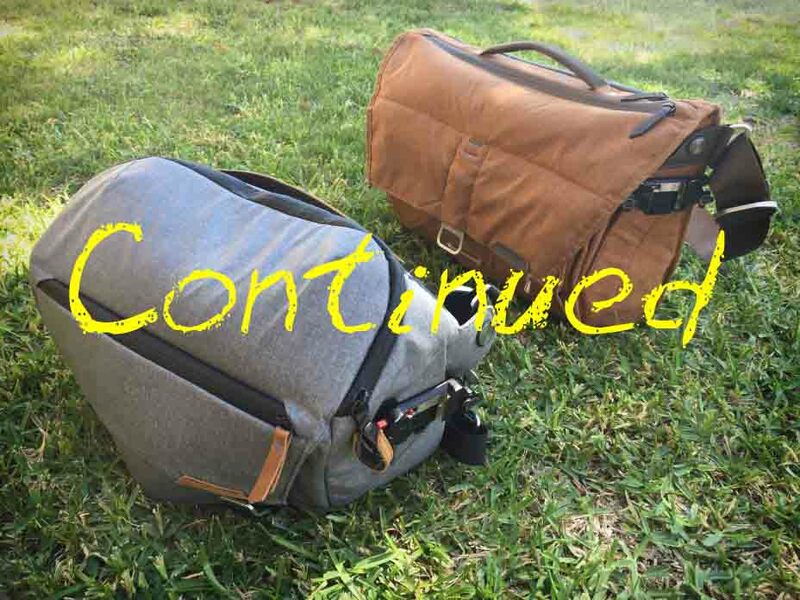 When I wrote about the Everyday Messenger in my post “Everyday Messenger, is the honeymoon over?” in May 2016 I truly believed I had found the perfect bag and never thought I’d switch cameras. For what I used to carry, a Canon 6D with a lens attached and two more in the bag, the Everyday Messenger was perfect. However, since switching to the Sony A7R, the Everyday Sling seemed a better fit, and this is true because of the lighter camera body and less lenses. Don’t get me wrong, I still love the EDM and it’s still the best bag I’ve ever owned, but it’s now my travel bag. At 54 years old I still learn something new almost every day and the lesson learned here is this; if someone asks if you’d like to try a product, you might want to take them up on it. When originally contacted about trying out a bag, I told them I was plenty happy with my Everyday Messenger, fortunately they still sent me a bag. I say this because had Purple Orange Brand Communications not contacted me I definitely would NOT have bought the Everyday Sling, I was completely content with the EDM. Again, a HUGE thank you to Purple Orange Brand Communictions and the wizards at Peak Design for giving me the opportunity to use the Everyday Sling! Next Post: MIA Photo Fair!